Is there a pot of gold at the end of the rainbow? Click here to play! Well, yes there is. But before you can win it you have to spin up the best combinations on offer at this wonderfully colorful slot machine. 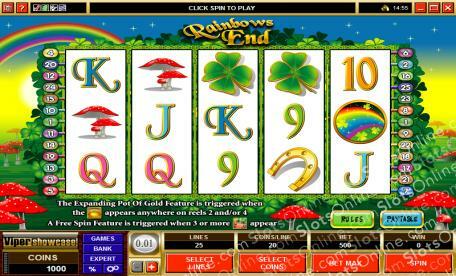 Rainbows End is a 5-reel slot played across 25 pay lines, with the more lines opened up meaning greater chances for lucrative combinations. The Pot of Gold can be substituted for all symbols except Scattered Leprechauns. The Leprechaun can appear anywhere on the reels and pays out up to 100 times your initial wager. If you manage to earn three or more of him in one go you will be rewarded with the Free Spins Feature, where you can win a stack of free spins. Also, whenever you win on the Rainbows End reels, you will be offered the chance to Gamble in order to double or quadruple your winnings! Rainbows End is a fantastical slot just waiting for you to come play. The Leprechaun is Scattered and can appear anywhere on the reels with two or more to earn a payout. If at least three show up after one spin, the Free Spins Feature will be activated. The Pot of Gold appears on reels 2 and 4 and can be substituted for any other symbol on the reels except Scatters.